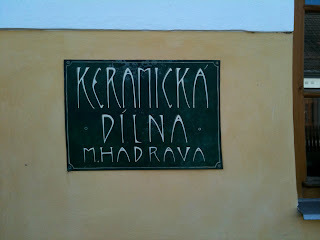 We've been waiting to go and see this ceramic shop/store in Klikov since last December when we met one of the ceramicists (Ms. Marta Poznickova) at a Holiday Open House in Schrems, Austria. She had some enticing green plates and cups for sale and we wanted to see more of them. Klikov is ~southeast of Trebon, east of Suchdol, and south of Chlum u Trebone (see previous postings), near the Austrian border. 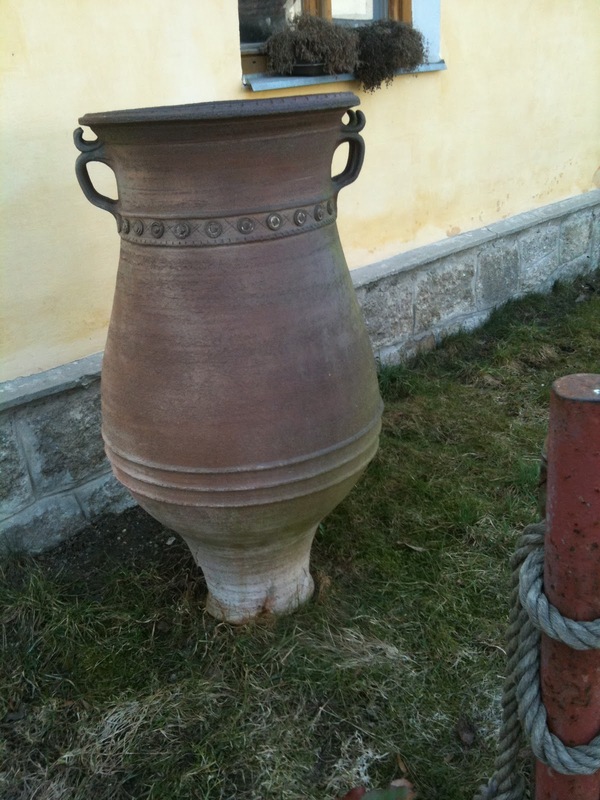 It is one of the most famous villages in South Bohemia for ceramics, widely known for its concentration of potters during the past centuries...due to the high concentration of clay soil surrounding the village (unlike Suchdol and other points west which have primarily sandy soil). 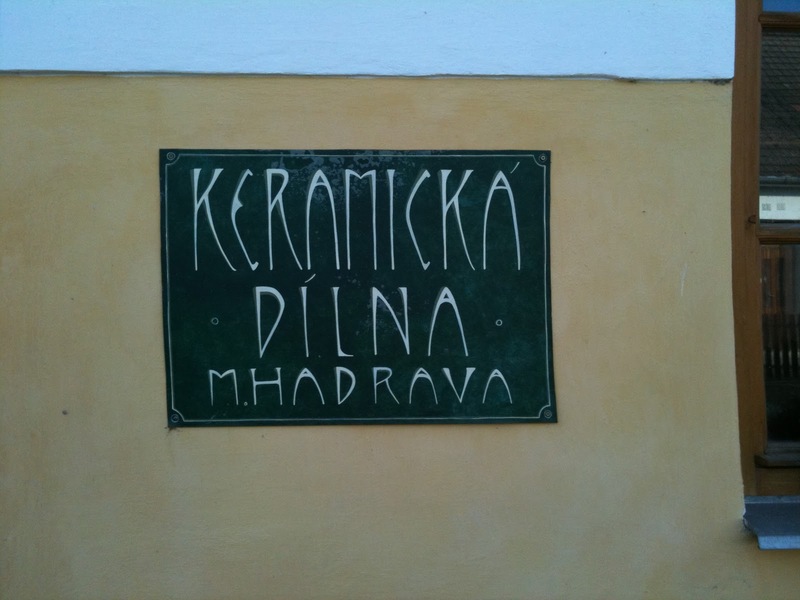 The Keramika Dilna, operated by Martin Hadrava and his wife, along with pottery from Ms. Marta Poznickova is an old manufactory with a large wood-stoked Kassel kiln which is still used today for firings. Martin's wife, who is Japanese, also had a special Japanese kiln built which is used to make their particular Japanese ceramics as well. So, here is a perfect blending of the ancient Klikov keramika together with Japanese techniques. It promises to be a delightful visit! Our dear host, Jan, kindly arranged for the visit so we could meet Martin and Marta at the workspace and store. As we step through the workspace with numerous wheels, clay and recent but unfired pieces, Martin takes us on a tour of the Kassel kiln. Here you can see the carefully made kiln with numerous stones and bricks lining the walls and ceilings. A few pieces are being stacked inside for a future firing--they do one firing/week. 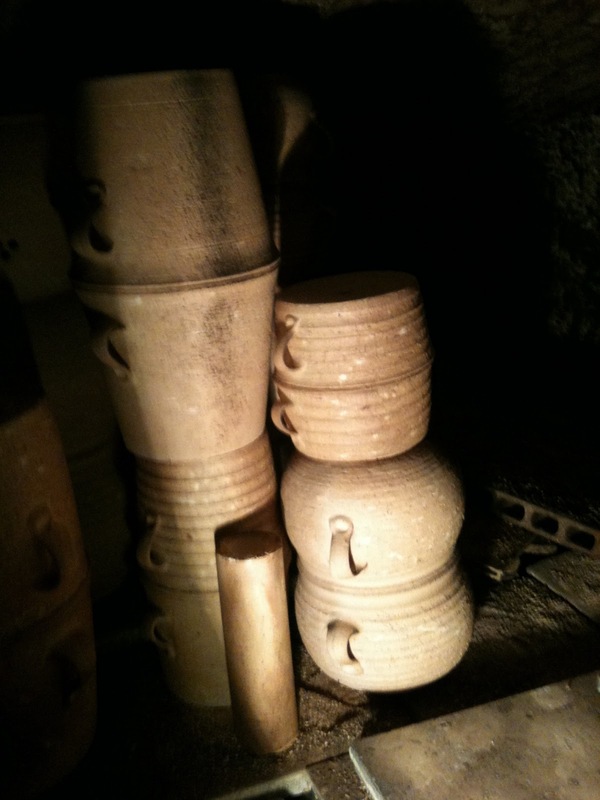 Of course, when the high temperature firings are done (1300 C) to make hard and more durable rather than soft ceramics (done at lower temperatures and not as durable), the kiln is filled to the ceilings with stacks of dried, new products. Each are placed in specific places and heights within the kiln according to the range of heat desired for the glazings, etc. It is gratifying to see that this Kassel oven is still being used. 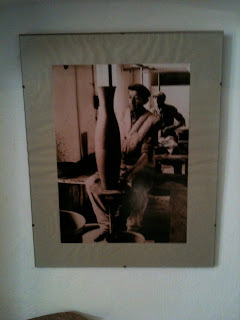 Equally amazing is the formation of a society in Klikov, The Society for the Preservation of the Pottery Tradition in Klikov (visit their website at: http://barok.org/clients/klikov/exhibition.htm). 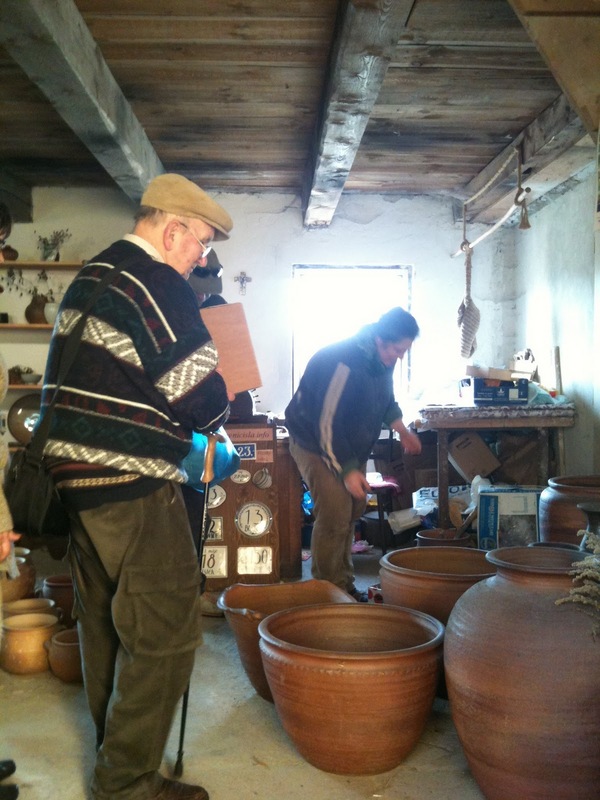 Different clay types were mixed, depending on the type of vessel to be made: water-proof ones for liquids, such as Moravian wine, or those needing to withstand quick heating/cooling (cooking pots), versus more porous ones for flower pots and containers. Quite an art to process the clay before even getting to the wheel! 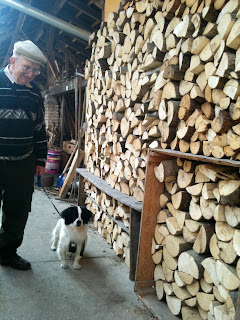 Here is some of the stacks of drying wood for use in firing the Kassel kiln. 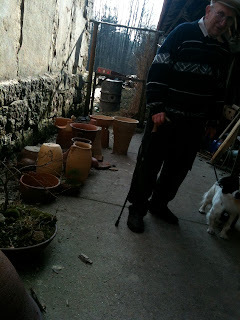 Our friends Jan and Radka accompanied us there, along with our friends Sarah and Amy....as well as the sweet dog Ruby (one of our favorite pets in South Bohemia!). Here Jan and Ruby greet you next to the wood pile! In 1883, Klikov became the center for making particular pottery from the local clay, fired at the right temperatures to become hard pottery. Many potters moved here to expand the variety of products, known as Stoneware Crockery. 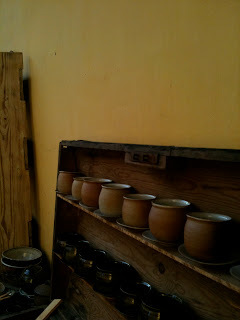 Other nearby villages produced the softer stoneware, such as Tust, Hamr, Suchdol, and Chlum u Trebone. We were taken back in memory to the famous stoneware crockery of Redwing, Minnesota which has such established fame in the midwestern United States. The Stoneware Crockery from Klikov was equally famed, highly used and treasured throughout southern Bohemia and Austria. is represented with an actual specimen! 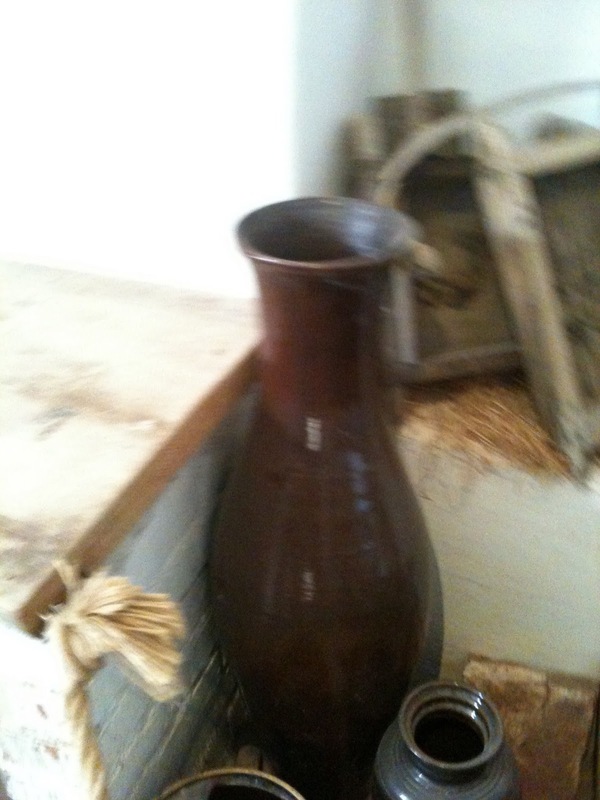 The most common pottery was earth tones and various types of glazings. Here on the middle and lower shelves are historical examples of baking moulds for cakes (particularly Babovka or pound cake made from potatoes), baking dishes, cups, small containers for honey (med), etc. 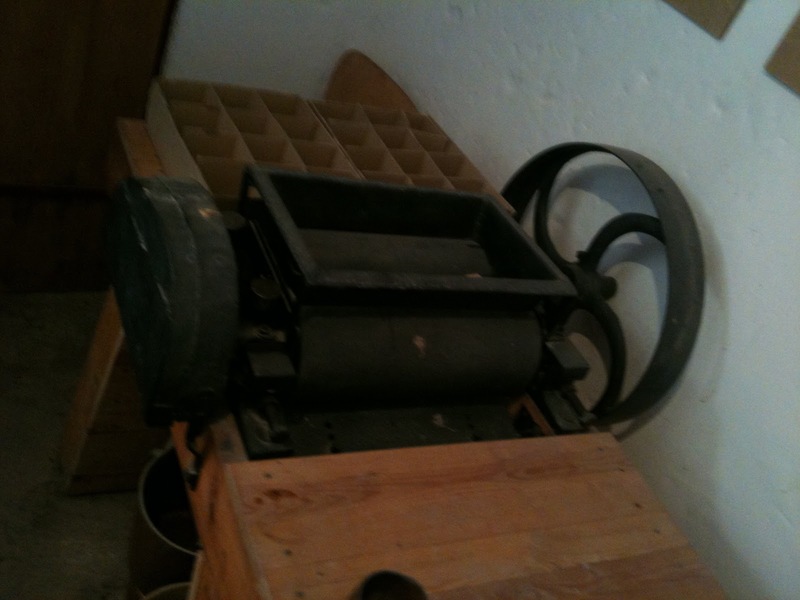 To the left in the this picture, you can see more of the baking moulds. We have a few examples of these to take back with us. This is very fine white ceramics! 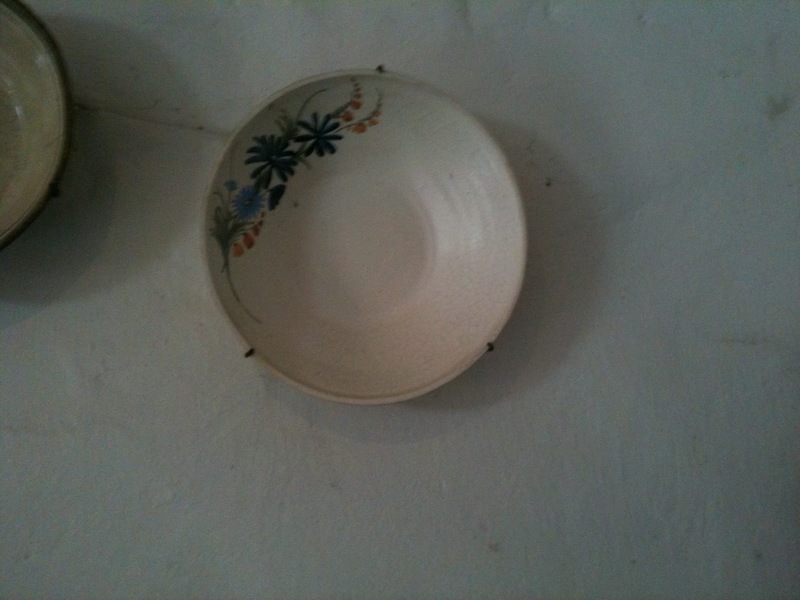 This bowl has a delicate sheaf of wildflowers enhancing the left side. On closer examination, you can see some are blue flowers from the Aster family (Asteraceae), most likely chicory (Chicorium intybus), a blue daisy of some sort, and tubular flowers which could be lily of the valley (Concallaria majalis). Then there are the large crocks, pots and wine flasks which were so important for food! 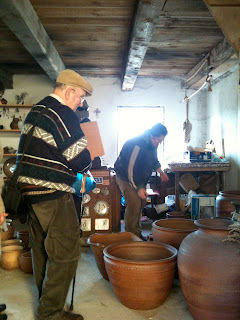 Then we move into the store which is a very large room filled with all types of pottery from both kilns and all three potters! Where to begin?! We had to wipe the tears from Neil's eyes as he looked at these gorgeously large containers for making pickles, sauerkraut or for use as growing containers outside. They are simply too large and heavy to ship back to Minnesota, much less put into our carry-ons! 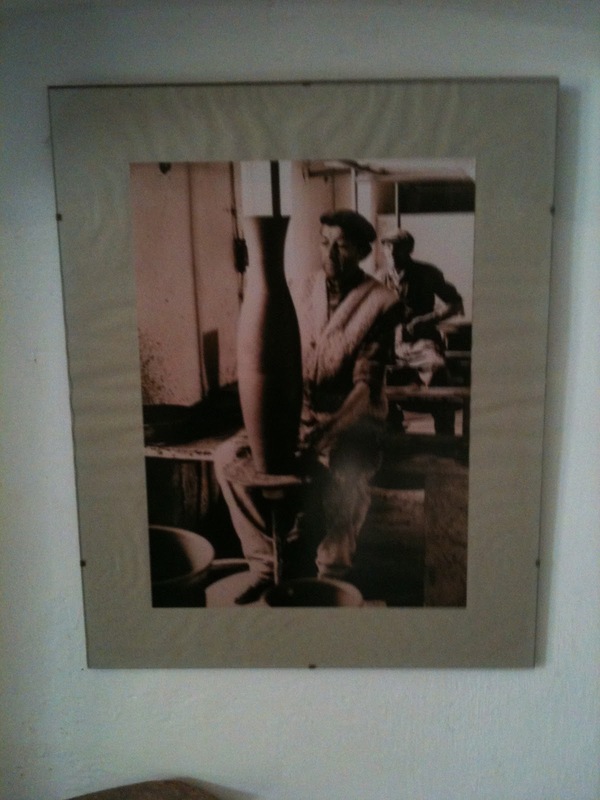 You simply must make a visit to Klikov and see this historic working kiln, visit with the potters, find some fantastic piece you can't live without and maybe take a class or two that they offer! Be sure to stop by and visit....you'll be so delighted that you did! Disclaimer: This blog is not an official University of Minnesota or Fulbright Program blog. The views expressed are my own and not those of the Fulbright Program, the U.S. Department of State or any of its partner organizations, or the University of Minnesota.